WANTED TO DROP A NOTE TO YOU AND ALL THE PRIMAL / PALEO CLAN OUT THERE. ITS BEEN A FEW MONTHS AND WANTED TO LET YOU KNOW HOW I AM DOING. THE BIG STORY IS THE FOOD… IT WORKS!! I NOW KNOW THIS BECAUSE MY EXERCISE IDEAS TOOK ON A CHALLENGE ALL THEIR OWN THIS YEAR..And it seems the FOOD foundation held up GREAT! THIS PAST JANUARY I HAD A SERIOUS PRIMAL ENCOUNTER WITH A LARGE MALE DEER( I did dispatch said Deer and eat it) THAT REQUIRED SOME SERIOUS SURGERY. This was shortly after that pic of me in the flip-flops in the snow. ..This LED TO MY CURTAILING OF SERIOUS EXERCISE AND OTHER HEAVY LIFTING THINGS..I WAS VERY CONCERNED ABOUT WHAT WOULD HAPPEN TO ALL THAT DETERMINED EFFORT I HAD JUST PUT INTO MY LIFE BY HAVING TO SPEND MONTHS LETTING MY BODY HEAL UP..I HAD BOTH RIGHT AND LEFT SIDE ABDOMINAL WALLS TORN UP AND SPENT 4 HOURS IN SURGERY GETTING MYSELF REBUILT AND RESEWN BACK TOGETHER…ROBOTIC SURGERY IS A WONDER OF MODERN MEDICAL SCIENCE…BUT I WAS PUT ON THE INACTIVE ROSTER FOR MONTHS AS FAR AS WHAT I COULD AND COULD NOT DO….ALL I CAN SAY IS IT DOES INTERRUPT ONES “PLAYING” WITH BIG TOYS….NOT FUN….OUCH! I WANT TO LET YOU KNOW THAT EXERCISE IS ONE THING..BUT I HAVE LEARNED THAT THE FOUNDATION IS THE FOOD…YOU DONT HAVE TO BE A FANATIC AND DO RADICAL EXERCISE ROUTINES OR GO TO A GYM FOR ELITE FITNESS OR ANYTHING AT ALL FOR THAT MATTER…JUST GET UP AND MOVE AND DO THINGS THAT REQUIRE A LITTLE MORE THAN USUAL EFFORT….AND IT WORKS! !…I HAVE NOT SEEN ANY REVERSAL AT ALL! !…I CAN ONLY ENCOURAGE EVERYONE TO GET WITH THE FOODS… THE PROPER FOOD INTAKE WILL KEEP YOU SOLID AND FREE FROM WORRY ABOUT WHETHER YOUR GOING TO “ENLARGE” AGAIN…LOL… I CANT SIT STILL..I LOVE TO MOVE AND WALK AND CLIMB TREES AND DO THE STUFF I DID AS A CHILD AGAIN…I PLAY LIKE A KID SET FREE OUTDOORS AGAIN ..AFTER BEING LOCKED UP IN A HUGE NON FUNCTIONING BODY FOR YEARS…THIS IS GREAT!! !…So I encourage any and all activity that you can do..especially walking around anywhere..Its what people used to do all the time,walking around is a foundation stone in the rebuilding of yourself. Heres a 6 pack of pics from the last few months…just to let you see the continuity of body size! 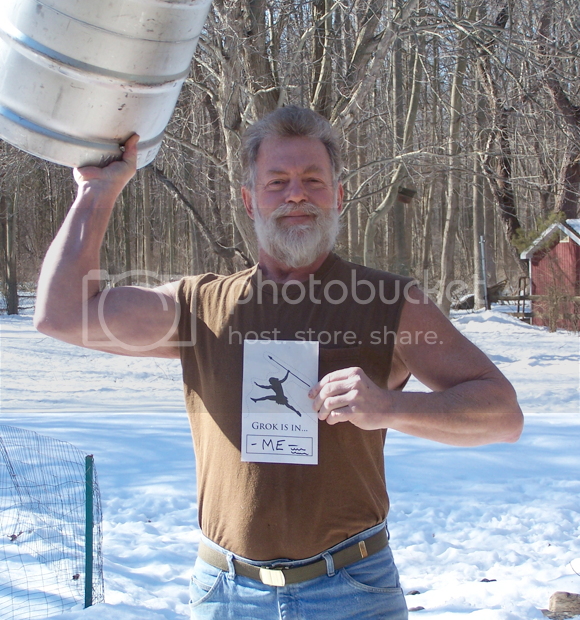 PIC #1 IS MY USUAL SELF HOLDING MY KEG UP…AND THE PICTURE SAYS IT ALL… This pic was taken in February of this year. 1 month after the surgery I was lifting 40-50 lbs carefully. I was so healthy and strong the doctor let me have my own leash and told me to manage myself and not be foolish and hurt myself again(PRIMAL RULE). So it was my toy to play with. I just motored around and ate GOOD PRIMAL FOOD and watched my intake and output..I was the “test steak”..always testing what was happening to me. I simplified my cooking and cut down on the elaborate fancy dinners. 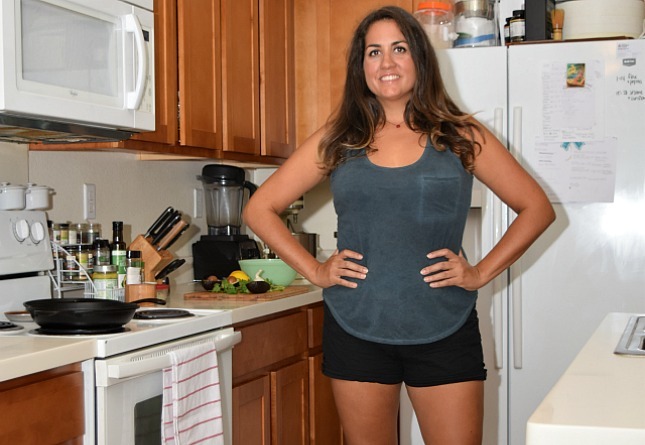 I was concerned about my output of energy that was not up to the usual …Even though ALL OF MY FOODS WERE PRIMAL..I WANTED TO FIND OUT WHAT HAPPENED WHEN I WENT TO a more SIMPLE,FRESH,NON-ELABORATE MEAL…MORE PURE AND NOT SO MANY INGREDIENTS ALL AT ONCE. I continued to see NO CHANGE in weight but was always wondering about loss of strength. The real test of muscle loss due to a lighter schedule would come later when I was able to Go after the big toys.. I keep very good track of what I eat and Dont eat>>> I found out for sure it’s THE FOOD IN GENERAL (Because I really switched it up a lot as far as complexity and variety went)..NOT ACTUALLY HOW YOU PREPARE IT that is what WORKS! 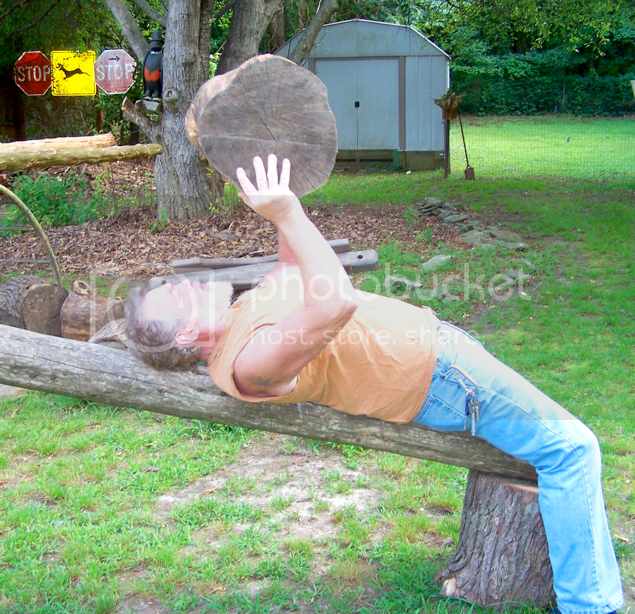 Pic #2 .After a while I could carefully lay back and lift the log rounds(70-90bs). I had to be careful! The grok in me was on the lookout big time. I had to do something so I was careful and holding the log in and then rolling it up and pressing it was safe and I was in control. Hugging the log felt good, the abdominal support of tucking it in was a great way to actually control what I was doing. It was nice to feel my body heal up and start to be able to do the Daveman thing again. Pic #3 Is me with a GROK stick I made for an Army Special Forces buddy of mine. I still made nice things while recuperating…THE CARVING KEPT MY CORE SOLID AND MY ARMS AND HANDS STRONG…I dont like to sit..I only sit when I eat or drive..Im actually standing here at the machine writing this..I built a shelf on the wall for the monitor and a riser for the keyboard and mouse. Pic#4…by May/June I got the release papers and went back to active duty there…That “stick” is over 10 feet long and weighs over 100 pounds..I went straight for the real stuff….BIG>>>THE BIGGER THE BETTER…MY WEIGHT WAS STABLE AND MY MUSCLE MASS WAS STILL INTACT…EVER PIC UP A BIG STICK?? ITS NOT AS EASY AS IT SEEMS..THAT TESTED MY CORE AND ABS WHILE DOING THE BALANCING ACT AND I WAS DOING GREAT..still being watchful but SO GLAD to be able to go out and pick up large awkward items again. Pic #6 …this was taken on September 30th of this year. 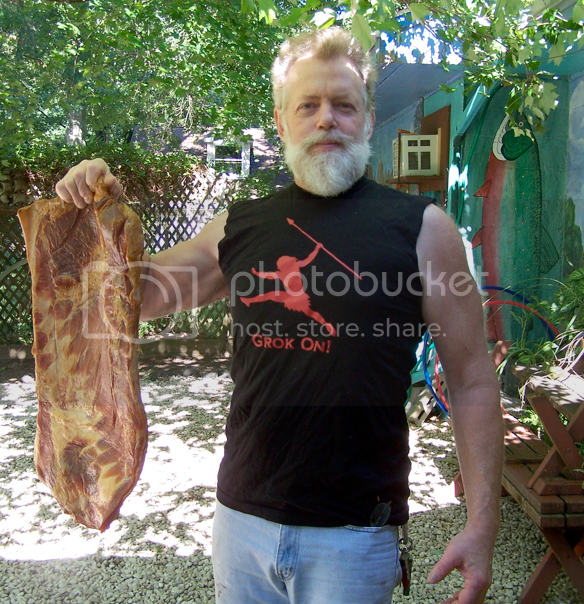 thats the Daveman/PAPA GROK holding a 12″ x 24″ slab of one of our favorite things. You can see that the lifestyle I chose BY FOLLOWING in your footsteps has been very good to me. Injury/recovery/rehab in the PaleoGym… through 120 plus days of change in me and weather and life itself..And there I am. Strong/Healthy/Solid. This IS what the Primal/Paleo way of eating and exercising will do. EVEN IF YOU ARE NOT ACTIVE AND CANT GO FULL OUT WITH THE EXERCISE THE FOODS WILL MAINTAIN YOU PROPERLY. 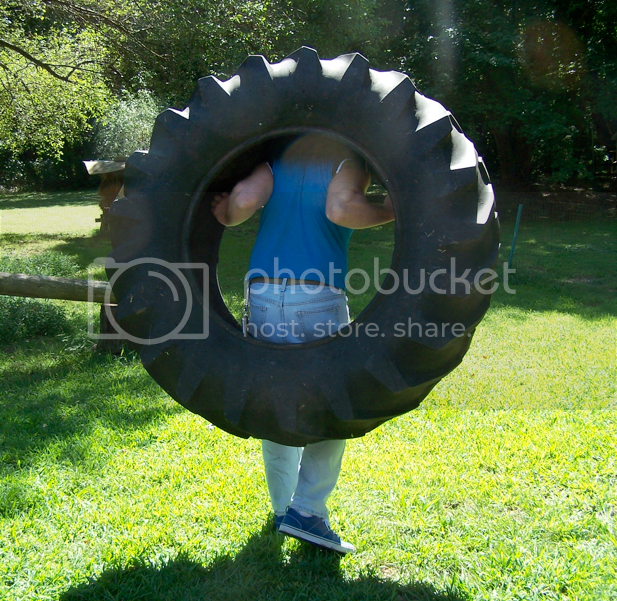 OVER 6 MONTHS AS TEST STEAK FOR ME..FROM NO EXERCISE AT ALL TO PLAYING WITH 300 POUND TIRES..THE LIFESTYLE SUPPORTED ME AND MY BODY AND I DID NOT GAIN OR LOOSE ONE POUND. I AM 6’1″ TALL AND WEIGH 205 POUNDS AND SLIP RIGHT INTO A PAIR OF 32 INCH JEANS…..THIS WAY OF LIFE WORKS!…MY BEST WISHES AND REGARDS TO YOU AND EVERYONE WHO STEPS ONTO THIS PATH…IT IS SUSTAINABLE, IT WORKS, IT IS THE WAY..
P>S> I am Active on Facebook with the Primal/ Paleo movement. Many people have found me due to the success story from your blog. They continue to find me. I am “inspiration” as they call it. They have even given me the nickname of “PAPA GROK”. I continue to support the efforts and guide as best I can, all who come my way. I have learned from many..and I am walking the center of the path. The variables in human nature and what they like and want to do are vast..So I make sure there is room for them to pass on both sides and support them all in their endeavors. Learning is something I will do forever and this way is a great place to learn..to live..to experiment and find your space that works for you…And it all started with a 30 day challenge 2 years ago….I never looked back. and I owe you many THANKS MARK..
Dave was credited as the information for last week’s paleo success story, so it’s great to see his continuing story this week! Wait–not information! Incredible, massive, soul-filling INSPIRATION. That’s more like it. Well put Anne! Dave is who convinced my uncle to give primal a shot. I can only imagine how many people he’s inspired. Dave is who finally convinced my dad to go for it. Now he’s well on his way to being happier and healthy than he has been in years. Just wanted to say ‘Hi Dave’ in case you read this and let you know how much your story means to me. Although I’m a girl and stay at home mom/student, something about the tone of your story just really rang home for me. I am 27 pounds lighter because I read your story and that spurred me more than anything else to start PB. I will transitioning the rest of my family to this lifestyle over this summer. Thanks so much for being you in your style! This is always one of the posts I show people. Papa Grok – Grok On! Papa Grok! Love it and you!! It is because of you I am on day 5 on the challenge and doing well, after years of trouble with allergies and food, my mind was in the right place, and up popped the challenge and your story. I feel amazing. Have had no carb flu, no cravings, and my body has SHRUNK overnight?!! Inflammation going? Not just water retention leaving, I’ve had that before through cutting our carbs (in an excessive way, supported by artificial sweeteners), this is more more than that – like skin settling back onto my body properly or something. Very surprised by how quickly I am seeing results. Anyway, I’m in, I’m hooked, I’m not going back. One of the greatest things is I bet he’s close to 60 years old, right? give or take? I’ll TAKE IT!!!! I’m hoping my parents will someday take my advice and get on board with this movement! Great inspiration Dave! You’re a beast! I think he not older than 55 years at this point. And he’s also awesome. yep Speno, my bad….I think he’s about 54. oops sorry, BUT STILL looking great none the less!! I just read his original post a couple years ago. way cool. You are a HUGE inspiration, Papa Grok! It’s always nice to see what fit people like Mark have done with this program, but the real inspiration, for me, is what someone in my age range and out of shape, like me, has done with this program. I’m in to the 4th day of the 30 day challenge and I’m down 3 lbs. without really trying! Mostly I am excited for this to work for my 75 year old, Mom, who was recently diagnosed with Type 2 Diabetes! So, thanks so much for the incredible story and for sharing it, so well, with all of us! I’m so thankful you are well and still “groking” on! God Bless! Awesome to see you so successful, and getting through a pretty major rehab so quickly. Thanks for sharing with us. This is amazing. You are correct, this is the way! An amazing story once again. Glad he’s doing all right. Wow, what did that deer do to you? I’m frightened to find out. Way to go on the simple meals. As a mininmalist cook myself, I have to agree. Congratulations on the rehab! I know! That was the missing part of the story, wasn’t it?! Glad you are ok, Dave! I’m guessing he decided to hunt the deer, but without a weapon. Very nice to see that Dave’s spirit is still intact. Yeah, I wondered – but how do you do that? Wrestle it? I hope he comes back and tells us! I was charged by a stag while minding my own business running on a forrest trail. He did have a few does standing around, and he might of thought I was a threat to them. I feel really lucky that he didn’t decide to gore me with his antlers. So inspiring!! Even for a 21 year old female like myself, I think anyone reading this can relate and be motivated by his enthusiasm and success. Love it! I love this guy. He totally embodies what the primal way of life is all about: being good to oneself, being good to others — just wringing every last drop of goodness out of life, no matter what it brings. Way to be, Dave! You know, I was just thinking this morning that the perfect first Friday success story for this year’s primal-challenge would be an update from The Unconquerable Dave, and here it is — awesome! Dave, yours was the first Friday success story I saw after reading the book and subscribing to the blog — seeing that, I knew I could either do it too, or I could make excuses why I didn’t. 85 pounds later I’m still in-progress, still learning, still fighting the good fight. You continue to inspire, Dave — Grok on! Why do people write e-mails in all caps? This blows my mind. STOP SHOUTING. Gosh, so sorry. Take your mind elsewhere then. In this case, the caps are simply part of what makes Dave “Dave”. He is not purposely doing it to shout. After reading his story, this is the only thing you can think to comment on? Try looking a little more for the positives in life. You’ll feel better, angry boy. Funny Pete! I don’t think he knows “shouting” either. No biggy. I imagine him as shouting, but in a happy way. He’s just excited. Not everyone can pull it off, but I think Papa Grok can. I notice a lot of over 50 people type all caps. Maybe it helps them SEE BETTER!!!! LOL!!! Usually it annoys me, but with Dave, I don’t care. I love that guy. He really is such an inspiration! Yeah, almost as annoying as nitpickers, ain’t it? From the other phrases in his story I think he’s prior military (maybe? “Release papers” and “active duty” among other things) and it’s standard to write in ALL CAPS in the military. My guess was that’s it’s a hold over from that, if he IS prior military. Even if he’s not prior military, pretty sure that’s just Dave being Dave. He’s very enthusiastic, and I’ll admit, it’s part of his charm. This is amazing. It is sustainable, I totally agree! Been primal now for 1.5 years and don’t even look back. I don’t miss any of the SAD foods at all. And you’re right, the (primal) foods will maintain us properly. too bad we don’t get to see a picture of the other guy: the deer. Amazing – thank you so much for sharing! Dave never fails to amaze me. Keep on rockin’, dude! DAVE ROCKS MY GROK SOCKS. GROK ON DAVEMAN! Glad you won the fight and lived to continue telling your tale. “IT IS THE WAY”… I love it. Awesome job Dave. Keep leading the way, you inspire so many. Good to see Papa still kickin’ it. Love the deer crossing photo with the stop signs. I guess that deer didn’t pay attention and used you as a brake?! 🙂 You’re a great inspiration to everyone Dave. Keep it up! I’ve been forwarding your story to everybody, Dave, and I’m just gonna come out and say it: I’m a little bit in love with you. How else with such vitality! THANKS FOR THE INSPIRATION! Especially on a day I felt close to giving up. Thanks, Craig! Haven’t fallen into any of the bad old ways and I’m not planning to! Had a bite of 70% dark chocolate today, which I figure is OK, especially as I tend to be too all-or-nothing about stuff. Just struggling to make time for physical activity with office stuff being wild. Grok on, and once again, thanks for the encouragement! Okay this was just great. 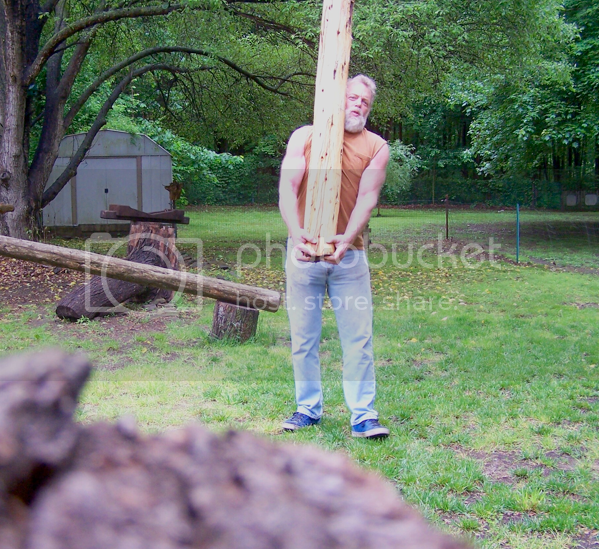 The caber toss was my favorite…gotta see that in person. Being the Scottish Lass that I am I loved that one. Keep up the great work of making life acceptable and happy….here is my motto. Awesome recovery DAVEMAN. I can also attest to the food being a major factor. I used to have to workout with chronic cardio daily for 45mins-1 hour just to maintain my weight when I was eating my vegetarian diet of lots of grains and legumes. Now I eat as much as I feel like, don’t need to feel guilty for eating fat, don’t get as hungry, and, can maintain my weight right now despite not having time to work out nearly as much as I’d like. Go Primal foods! Such an inspiration! Thanks for sharing Dave! Wow, Papa Grok! I had no idea you had such a severe injury! 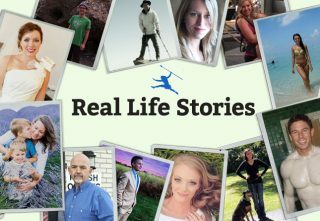 Yet another amazing tale to share about the primal journey you have undertaken! I continue to refer people to your original story, and will be sharing this continuation with everyone I know, especially the doubters. DAVE! – you look AMAZING! And I have to say it’s beyond awesome that you didn’t let such an injury defeat you and the Primal lifestyle!! So many people would’ve used it as an excuse and become lazy and eaten crap…but not you! LOVE your determination and dedication! Keep it up, Papa Grok! Simply amazing. GROK on Dave! Oh, Daveman…promise me you will never change. Love everything about you, even WHEN YOU TYPE IN CAPS. I’ve got a smile so big my face is cramping. I love where Daveman lives. It either snows or is sunny mid-summer. As if Dave’s story wasn’t already inspiration enough…he’s goes and blows us all away again! He is the real “Super Dave”! THANKS EVERYONE>>>HERES THE DEER STORY…A nice 7 point buck was flushed out by some other hunters and I was in the middle of the path he wanted…Dressed in CAMO..very hard for Him to see until the very last moment..
Lucky for me I had a long gun in front to block the impact but I took the antlers in the lower mid-section..both sides and this bad boy just threw me to the side…NEVER underestimate the POWER a wild animal can have. I did not get penetrated by the antlers due to the gun and the heavy clothes..but ended up with a torn Ab wall on both side on my body..I rolled over and raised the gun and shot him…dropped him right there before he could get more than 30 yards away. Adrenalin is a strong compound…Two friends of mine came by after the incident and cleaned the Deer for me and helped get me and it home… I knew I was hurt pretty good…The deer was cleaned well and hung up to age and I went to the surgeon….My son Ian skinned and processed the critter…then we ATE IT…AND YES!! !…IT WAS REAL GOOD..
Only would happen to YOU Dave!!! Your are the ultimate primal dude! And why is it his ALL CAPS are the only ones I read as enthusiasm and not yelling? This is awesome! What a beast! Caps lock is autopilot for cool. Thanks for the update! It appears you are doing well even after the incident. Like a lot of people, the first thing I ever read on this site was your story, which was linked to by someone promoting the Primal Lifestyle. Thanks for being the catalyst that started me down this path! Aww Dave is so wonderful. I love all his support and he is so motivational for the newbies. I am working on getting my boyfriend’s father to read these stories so we can keep him around for a long time. Thanks again Dave for encouraging me everyday on Facebook. You are great! Grok hug! Please post the link to his facebook page. Tried looking for it but didn’t find it. Epic, just epic! On that last photo surely you meant August not September 31 this year? Or do you have a time machine? Ha! If anyone had a time machine, it would be the Unconquerable Dave! We love you, Papa Grok! Keep Grokking and inspiring your little Groks! Way to go keep kicking the asses of the logs, have no mercy on them they deserve it. Thank you, Papa Grok, for your enthusiasm and inspiration. You have made my week. It’s definitely all about the food and just simple activites like walking. Works for me too! Dave was one of my original Primal inspirations (after mark, of course!). Keep on living, my friend whom I have not yet met! I have to agree that was a great quote. I put it on my Facebook page. You grok my world!! Keep inspiring! Thank you, thank you Daveman! Your original success story was one I read, re-read, shared, linked to talked about again and again. Now reading your update, I’m doing it all over again. All the inspiration I could ever hope for heading into the weekend our dear friend!!! That was a tease. I want the deer story. Awesome story and transformation. Thank you for sharing and inspiring all of us! Dave’s an inspiration of that there is no doubt. 205lbs and a 32in jean. Holy heck. Once again he inspired someone, I have been trying to get onboard with this and have had a reluctant spouse. Not anymore, I think it hurt his feelings to see how in shape Dave got when all my hubby needs to do is lose 10 pounds and workout a little. I on the other hand…..
Dave, thanks for confirming that it really is all about the food — and the general primal lifestyle attitude of which you are definitely a phenomenal example! It was wonderful to hear what you’ve been up to lately – and thanks for proving that it really is all quite sustainable. Dave (aka Papa Grok), you are a hoot. I like your style! Thank you for filling my inbox with inspiration and laughter today. Glad to hear you are reunited with your “big toys”! Dave is pretty much the man. Absolutely brilliant in what he does. He can capslock all he wants, he earned it. Dave makes me want to go outside and play! Thanks Daveman. Now I can better imagine what cavemen must have looked like 10,000 years ago. Grok on PAPA Grok! LOVED THE ORIGINAL POST AND LOVE THIS. (The caps make it even better, btw.) Papa Grok, you’re an incredible inspiration. Showed your story to my husband, who is just beginning his Primal journey. Thanks for sharing! Best wishes to you! Love the Daveman. His enthusiasm just bubbles out of him and is infectious! STILL love reading about Dave!! thanks mark and dave for the story. Here i was feeling great on passing on the movie treats – not that they were treats or anything. why don’t they offer celery and carrots instead of poison? He is such an inspiration!! THIS IS A MAN WHO COMES FROM THE SCHOOL OF “HARD GROKS”…LONG LIVE THE UNCONQUERABLE DAVE!!!! 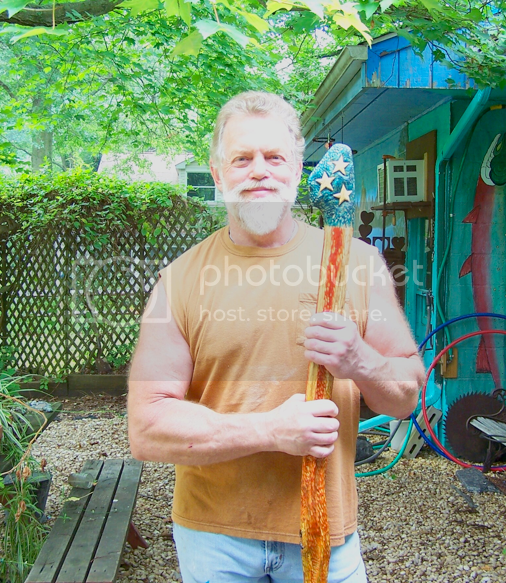 DAVE / PAPA GROK: You are an amazing inspiration to all of your PRIMAL friends! Thanks for sharing your story of the deer encounter and the aftermath. I keep telling many of my fitness friends/enthusiasts, and people who want to lose weight – that exercise is a small part of the equation, but FOOD is the biggie! You are truly proof of this fact that Mark has helped teach to so many. GROK ON FOREVER! Love you Papa Grok!! Your story is amazing!! Facebook’d your awesome philosophy Dave, about letting people be who they are. Thanks for that–I always forget that part. You (and Mark, of course! )are inspirational! Grok on! I believe there are only two kinds of beings that can write in all caps. Animals and Demigods. And this man is a animalic Demigod. Dave’s story is AMAZING! so inspiring. Reading the success stories really spur me on and make me excited to be going primal- I love it! This is awesome. I have been doing the Primal diet for four weeks now and have noticed changes, and this is the biggest piece of inspiration I have recieved so far. Dave is a true caveman in every good sense of the word, and a complete badass. The picture of him barechested in the snow, arms out, that crap HAUNTS me. Again, awesome. Papa Grok – really inspiring read! You rock, Dave! Grok on, brother! Dave, will you marry me? Ooops, better not, I forgot we’re already married (to others). Keep me in mind for our next life. Dave’s original story motivated my 57 year old husband to try primal. He has since backslid but I’m hoping if I show him your update he will try again. Thanks again for the inspiration. My sister has nicknamed you “Grizzly Adams goes buff.” p.s. hope your beautiful yellow lab (as seen in the original story) is doing well. Fantastic thanks for the up-date, what an inspiration you are. the Grok stick is awesome!!!!!!!!!!!!! Nothing great was ever accomplished without enthusiasm … and if anyone isn’t enthusiastic after reading this something is horribly wrong. I have been doing PB for 2 weeks. No major issues. Dave your primal story rocks. Many thanks for sharing it.Do you have a blog/fb where people can follow you ??? PAPA GROK!!! YOU ARE AWESOME!!! I am proud to be one of your friends!!! You are the ultimate ‘Test Steak” and a source of inspiration each and every day for me!!! This is an amazing testament to what healing your body with food can do!!! Mark, you are also a huge inspiration for posting such great content, and your continued support is SAVING LIVES!!! Mine included!!! Amazing story. Yet another wonderful example of how ancestral eating, and a primal lifestyle is what we are designed to do. Your story has motivated me to start the Primal ways. I started out the same size as you started. I am 53 and tired of being overweight. Certainly was not me for most of my life. Like you, I have always been strong as a bear and want to retake that so that life does not retake me. Keep sending updates. It helps us all! What a great story you make. I agree with all the others – I’ve never met you, but I can’t help but love you. Grok on forever dude! Grok on! THE IDEA FOR THE COMING YEAR IS TO MODIFY THE PALEO GYM OUT BACK AND MAKE UP SOME NEW WAYS TO MOVE DIFFERENT MUSCLE MASSES DIFFERENT WAYS THAN THIS YEARS OR THE USUAL WAYS..THERE’S ALWAYS A NEW WAY…TO BE A GROK……..GROK ON>>>. Dave, I showed “The Unconquerable Dave” blog to my nutritionist. She said “Go for it!” So I did. But jumped off the wagon (no, I didn’t fall, I deliberately sabotaged myself! I take full responsibility). I’m grateful you updated here. Have climbed back up on the wagon. ThanksThanksThanks to you and Mark. Making Fish Soup (PB Cookbook) for supper; very simple. Again, many thanks. Here…take my hand…up you go..back onto the wagon!! I LOVE FISH SOUP AND STEWS!!! p.s. My workout gym is a sweet pea garden (need to start the digging now for planting in February) and taming the wild hysteria (wisteria) that is taking over my lilac and rose garden. The hysteria has also attacked a chainlink fence; I figure there will be much body twisting and turning to get that taken care of. Then build a proper pergola for the hysteria (hauling of 4×4 or 6×6 cedar posts should do the trick!). Dont forget to listen to your brain and body and adjust accordingly when lifting large awkward items and sacks of concrete.. Still so inspired by your story. I regularly think about your comments regarding just keeping the meals simple – and it will work. Simple is nice. But what about an update on the labrador though?! How can I find you on Facebook Dave? Love your enthusiasm and your inspirational story. WHAT IS YOUR TYPICAL DAY OF FOOD? HOW MUCH LIQUID DO YOU DRINK ALSO AND WHAT? DAVE’s original story is the reason I started Primal this week.His older photos are on my fridge!!! Gotta say “Mornin’ Dave” everyday and ask myself “WHAT WOULD DAVE DO?” i LOVE THIS GUY!! Any news on how Dave is doing in 2013???? Papa Grok: your story is one that motivated me to jump in. Since January of this year I’ve been “all in” and am enjoying success that I felt was beyond reach. I have struggled with my weight for the last 30 years but since going primal I’ve been able to trim five inches from my waist and drop down to a pants size that I wore in high school. With more energy and overall better health, I’m excited about the future and looking forward to the continued success brought by Mark and the Primal Blueprint. Thank you for being a role model and thanks to Mark for NOT believing the SAD information that’s forced upon us. Grok on! Thanks for the update Dave. You have inspired me once again. And of course I had to read part 2 again, too, for the full positive impact of Dave!